Kemper joins "The View" to discuss her new book and finale of "Unbreakable Kimmy Schmidt." hilarious Ellie kemper is spending Halloween at "The view" and her unique, quirky comedy is on full display in her hilarious new book "My squirrel days." Please welcome Ellie kemper. ??? That's a good one. Love that costume. Thank you very much. Thank you for having me. We all love that costume. You're the legendary aviator Amelia earhart. That's right. What made you choose this character? I can't think of someone more fearless than she. She was the first lady to fly across the atlantic ocean. She's one of the first women to get her pilot's license. That's pretty strong. That's pretty strong, pretty fierce. Now, the last time you were here you were pregnant. Yeah. And now you have a 2-year-old son James. Yes. How do you like being a parent on Halloween? I always struggle with the costumes. Exactly, right. Last year he was a chimney sweep which was really easy because I just put some dark shadow on his face to look like ash. Every baby looks cute. This year he's going to be a fireman. I selfishly love it because I get candy. When you take them trick or treating. Yes. You go with the children. I go. I will go with them if I have to. Always. I was like a senior in college and I went back to St. Louis and my brother at the time was like 11 years old and I was like, I will take you trick or treating. I dressed up as a gypsy. People are skeptical. You have to work for it. You have to pace yourself, you have to be not right behind them. At least mine, I don't want to embarrass them. Exactly right. You live here in New York City. I do. You're raising your son James here in New York City. Yes. Is it a different experience raising your child in this metropolitan city. Yeah. First of all, New York City, best city in the world. Second, I had no idea how many germs threaten my son. Like all of a sudden New York went from being a wonderland to being just like a germ forest. A petri dish. The train. Buses. Tap water is supposed to be the best water in the world and suddenly I'm convinced it's contaminated. Everything becomes a threat once you have a baby. It doesn't end either. Let's talk about your book called "Squirrel days" for some reason. I'm sure there's a reason for that. There is a reason. Should I tell you the reason? Sure. Tell me the story. The central story is about a squirrel I tried to befriend in my back yard when I was a girl. I tried to become his friend. Rejected me. I've moved on. Everything is fine. In the book you talk about Ricky Gervais. Yeah. He's a friend of the show. Was it a fun thing for you to meet him? Yes. I was on the American version of "The office." He of course created the British version. So I met him at the Emmy awards the first year I was on the show. I said hello, Mr. Gervais -- I probably didn't say Mr. Gervais. But he looked at me like confused. I said I'm you on the show which is psychotic to say because I'm not Ricky Gervais. I'm glad he's a friend of the show because he's not a friend of mine. I would be his friend. Ellie, we are such fans of your show "The unbreakable kimmy Schmidt." I'm so sad it's coming to an end. You have an amazing cast. Carol Kane, tituss burgess. You talk about the instant connection you had with him. I think we have a photo. What's happening in the photo? This photo -- can you see -- this was shot during the pilot -- pun not intended. This was shot during the first episode of the show and I sort of knew him but not that well. In this photo it looks like he's naked. It does. It looks like we're lovers and he's naked. I thought it was so funny when our friend showed us the photo. I started laughing so hard I wet myself while on his lap. He did not flinch. He was like, this is disgusting. You literally wet your pants on that man? I did, and he's still my friend. That is real friendship. You could have tried it with Ricky Gervais. Or the squirrel for that matter. I don't know what you would do if one of you wet your pants on me. We would still be friends. Okay, thanks, all right, fine. No one is fazed. Well, kids don't get to have all the fun on Halloween. We do too. So it's time for a game we're calling -- Mummy dearest. We're going to walk over here. Let's go. No -- How does this work? It's me and Meghan. I'm going near you. We'll win. First is Ellie and joy. We'll put 30 seconds on the clock. One player wraps their teammate in toilet paper until the buzzer. Try to cover as much as possible. Ellie, you wrap joy. I will wrap Meghan. The team with the best mummy wins. You got it? Great. Okay, ready? Should I start on your neck? Let's go! All: Four, three, two, one! You see that? I feel like I'm the best one. Look how pretty this is. I feel like I have the best one, I'm sorry. I'm sorry, Ellie, but sunny really killed it. I don't know what this is. This is more abstract. Who won? We won, we won! Our thanks to Ellie kemper. The final episodes of "Unbreakable kimmy Schmidt" premiere in January. Her hilarious book "My squirrel days" is available now and guess what? Members of our studio audience are going home can a copy. We'll be right back. 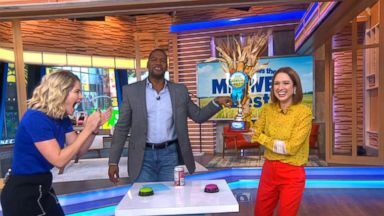 "My Squirrel Life" author Ellie Kemper stops by "GMA Day." 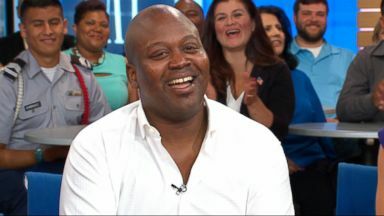 The "Unbreakable Kimmy Schmidt" star told "GMA" he has a love for legendary performer Diana Ross just like his character, Titus Andromedon.